I have always walked a lot. As a child, my parents were just about the only people in the neighborhood without a car so if I wanted to go somewhere, I had to walk or take the bus. It was perfectly normal for me to walk 2 miles each way to see a movie, and of course I walked to school every day – about a mile each way for high-school. For awhile I had an after-school paper route that started a mile and half from my house. Wherever I’ve lived – Washington, New Haven, Boston, New York, Toronto, London, and now Lincoln – I walk when I need to get somewhere as much as possible, and to explore new neighborhoods. Walking and swimming are my two favorite exercises. Since becoming an Alexander Technique teacher in 1981, walking has taken on new meanings for me. To start with, it was on a long Sunday walk in Toronto, the day after my first Alexander lesson, that I noticed strange things going on with my arms: my hands wouldn’t stay in my coat pockets, and my arms insisted on swinging freely! Later on, I noticed that my walking was taking place with a lot less effort. Over the years, it’s been an excellent activity for me (along with swimming) for exploring Alexander Technique directions. It’s also proven to also be an excellent activity for my students to learn about directions, and how to use and test them. See, for example. Throw it Away and You’re a Great Place to Visit, but would you want to Live there? One of the nice things about using walking as a teaching framework is that it’s an activity most of us are already doing over the course of our day. I’ve also found that the rhythmical quality of walking, with the power of propulsion shifting from one leg to the other, makes it relatively easy for students to notice how using – and then deliberately not using – directions affects their walk and how they can learn to preempt heavy footfalls with a useful Alexander Technique direction. Finally, a wonderful aspect of walking is the auditory feedback it can provide as a student’s feet arrive at the floor, particularly with hard surfaces and especially creaky wooden floors. I often tell my students that if they have wooden floors somewhere where they live or work, that will be the perfect place for them to explore directions while walking. Beyond these teaching considerations, I have found that walking is a wonderful way of letting my mind mull over a problem or question I’ve been working on. With surprising frequency, I find the solution or answer seems to just pop into my head after a nice walk! 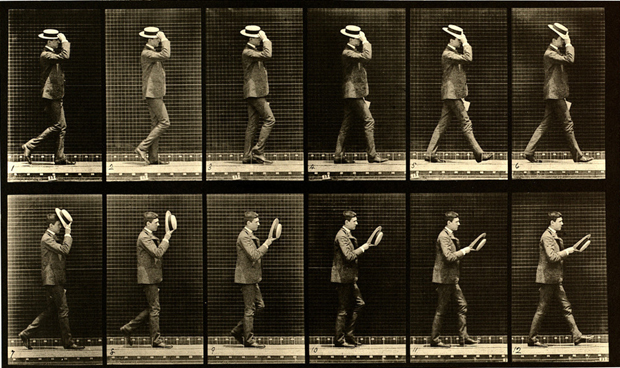 Photo by Eadweard Muybridge an English photographer important for his pioneering work in photographic studies of motion.